I found this one rainy morning in the parking lot beside our office, and decided to quickly shoot it before heading inside to start the day. A reminder that all sorts of interesting stuff is happening quite literally at our feet, and we'll never know what we're missing if we keep on walking. 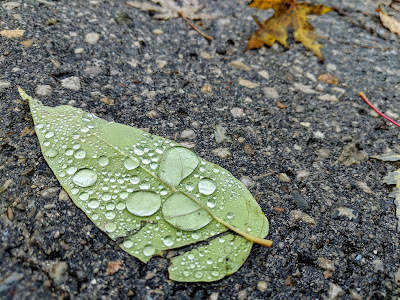 Is a wet leaf on an otherwise unremarkable stretch of asphalt going to change the world? Probably not. Is it a trivial thing? Of course. But as I finished shooting this temporary, mundane scene, a co-worker called me over and asked what I was shooting. She and I have had this conversation before, and she knows about my little addiction to the everyday. So I showed her the photo, and we chatted for a few minutes about why seemingly small stuff like this matters as much as it does. Because life is lived well when we slow down enough to appreciate the quiet, in-the-margin moments for what they are. And we lose out on all that color, texture, magic, warmth, whatever you want to call it, when we choose to keep walking. I'm especially glad I didn't keep walking on this wet, grey day. Not only did it make me happy. It made someone else happy, too. Those ripples. It's up to us to start them on their journey. 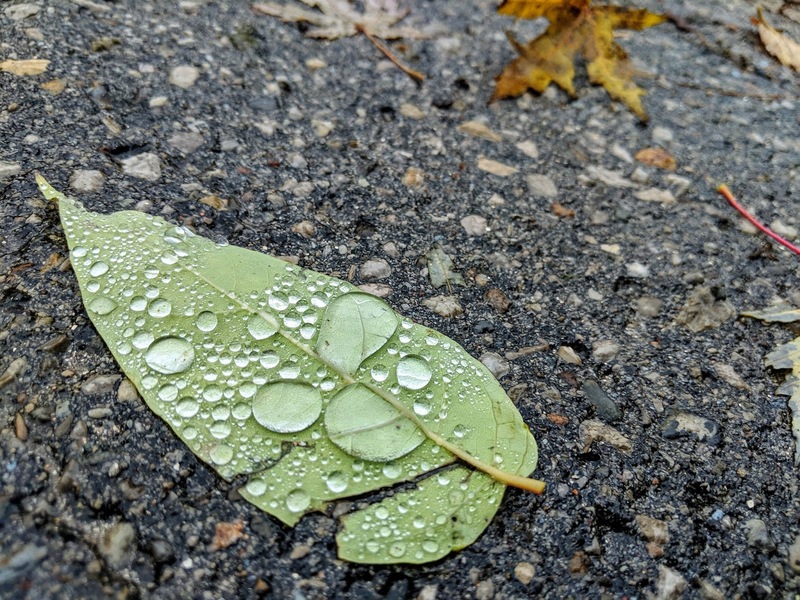 I love the waxy leaves and their reaction to the rain.